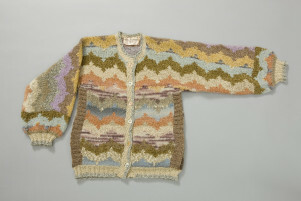 Crafts Advisory Committee Purchase Information Sheet completed by Kaffe Fassett for 'Interlocking Stripe Cardigan' (T25). Responses are handwritten in black ink. Signed and dated 6 October 1979.